Original Antique Maps and Prints. Antique Map-CANARY ISLANDS-FORTUNE-TENERIFE-Van der Aa-1727. Description: Source unknown, to be determined. Artists and Engravers: Made by'Pieter van der Aa' after an anonymous artist. Pieter van der Aa was born 1659 in Leyden, Holland. He started his own book publishing business when he was twenty-three. Within fifty years in his business, he published a huge amount of highly decorative maps and atlases. His Nouvel Atlas was reissued by Covens & Mortier. He died 1733 in Leyden. Subject: Antique map, titled:'Canaries ou Iles Fortunees. Chart of the Canary Islands (former Fortune Islands), situated off the northwest coast of Africa. Condition: Size (in cm): The overall size is ca. 38.3 x 30.5 cm. The image size is ca. 33.3 x 25.3 cm. Size (in inch): The overall size is ca. 15.1 x 12 inch. 13.1 x 10 inch. Medium: Engraving / etching with hand colouring on hand laid (verge) paper. ThePrintsCollector Peter Cornelissen, Margo van Latum - van Dongen, Frank van Latum Zeeland - The Netherlands. We guarantee our items to be genuine original. GO TO OUR STORE and explore our huge collection of fine antique maps and prints. FIND SIMILAR ITEMS IN OUR STORE. Visit our Store: we would like to invite you to review similar items in our Store or to browse through all other items in our Store. We are confident that you will find very special unique antique maps and prints in our Store. It is our privilege to have you as a customer. 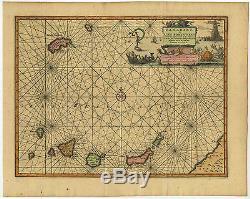 The item "Antique Map-CANARY ISLANDS-FORTUNE-TENERIFE-Van der Aa-1727" is in sale since Tuesday, July 4, 2017. This item is in the category "Antiques\Maps, Atlases & Globes\Africa Maps". The seller is "theprintscollectoruk" and is located in Zeeland.